"Writing is something you can never do as well as it can be done." There's really no such thing as critical consensus when it comes to Ernest Hemingway�he's got his fierce partisans, who view him as the paradigm of the great American writer, an author whose fiercely muscular prose changed the way we write. He's also got more than his share of detractors, who see in Papa almost the parodic version of what's worst in American manliness: fat, drunk and violent, hostile to women, deluded about his own capacity in the world. But whatever you think about Hemingway, we can all agree that there's one thing he hasn't been, either in his lifetime or the decades since, and that's neglected. And so the questions this documentary raises are not about whether Hemingway is worthy of examination, but rather about whether or not a project like this is the wisest use of the necessarily finite supply of resources devoted to documentary filmmaking. This is a reasonably successful look at Hemingway's life, and, at less than an hour and a half, provides the general contours for those who may be unfamiliar with the man or his writing. The film takes us through all the high points: the years in Italy during the first World War driving an ambulance for the Red Cross; the glory years in Paris; the ascendance to the top of the literary pyramid, with novels like The Sun Also Rises and For Whom the Bell Tolls; the very public persona and the Cuban years; the decline in reputation, the comeback in the popular imagination with The Old Man and the Sea, the Nobel Prize, the suicide. What's especially artful about the film is that it uses Hemingway's own words as frequently as possible�there's only a modest amount of talking heads stuff, and what the interview subjects say thus becomes that much more poignant. (Among those interviewed are the writer's son Patrick; his sister Carol; and Hemingway scholars Ann Douglas, of Columbia, and Sandra Spanier, of Penn State.) The documentary is at its most fun and giddy when going over Hemingway's influences (Gertrude Stein, Picasso, Joyce) and rivalries (John Dos Passos, Sherwood Anderson, William Faulkner, and most famously, F. Scott Fitzgerald)�it's a whole lot easier to keep track of this than of the comings and goings of Papa's many wives and children. 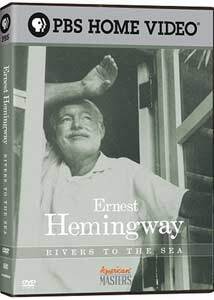 But the reliance on Hemingway's writings has a down side, too�it doesn't leave the documentarians with much to show us as we're listening to the soundtrack, so there are many arty, gauzy shots of nature, of mountaintops and flowing streams, giving the film the self-consciously downscale arty look of a wall calendar. At times Hemingway seems a genius; at others a fraud, or at least a self-promoter above all else. (His plan to take his fishing boat off the coast of Cuba and blow up U-boats seems especially grandiose.) We don't come away with a whole lot of insight�there's a brief mention of Hemingway being haunted by his own father's suicide, and just a few comments about Hemingway's own depression in his last days�but if this documentary encourages the uninitiated to seek out Hemingway's writings and make up their own minds, so much the better. Image Transfer Review: A strong and saturated transfer, though the film is more for the mind than the eye. Audio Transfer Review: The soundtrack relies a little too frequently on the same sonorous Bach cello solo, but it all sounds reasonably clear. Extras Review: A package (17m:56s) of five bonus interviews includes more footage with Hemingway's son Patrick; his daughter-in-law Valerie; screenwriter and Hemingway friend Peter Viertel; Professor Spanier; and Ann Douglas, who gets the lion's share of time, discussing Hemingway and "the life heroic." A very general overview of the life of the writer, and one that sometimes seems a little too Hallmark.